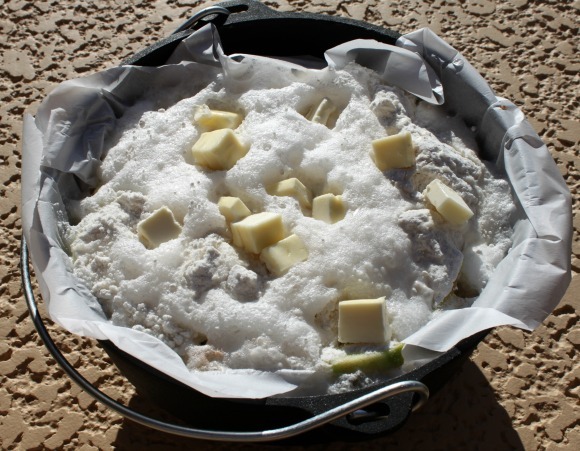 In my quest for the ultimate campfire dessert – I stumbled onto a number of recipes that called themselves a dutch oven apple cobbler. After reading the ingredient list I realized it’s more like a dump cake mixed with a cobbler. The good news is that it takes the best of both things – the ease of the dump cake and the fresh seasonal fruit of the cobbler and combines them. 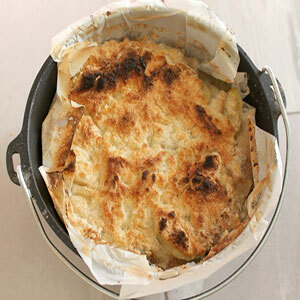 And much like everything made in a dutch oven – it’s crazy delicious! I highly recommend Granny Smith apples or some other tart apple variety. The sweetness of the cake mix really needs the complementary bite of a tart apple. While I love cast iron – I hate cleaning it. I can’t say enough about using parchment paper to line your dutch oven. It virtually eliminates scrubbing and doesn’t add any strange flavors to your food. In order to save yourself the mess of a campsite cleanup – I highly recommend prepping your apples at home with access to your full kitchen. Peel your apples. Then core and slice them. The thinner the slices the better because it’ll ensure that your apples are nice and soft without a very long cook time. Place your apples in a large zip top plastic bag. Sprinkle the lemon juice on top of them. Seal the bag and try to coat the apples with the lemon juice as much as possible. The lemon juice helps prevent the apples browning. However, if they do get a little brown – don’t worry. They’ll still taste just as good – they just won’t look as pretty. Open the bag up and sprinkle the cinnamon and sugar on the apples. 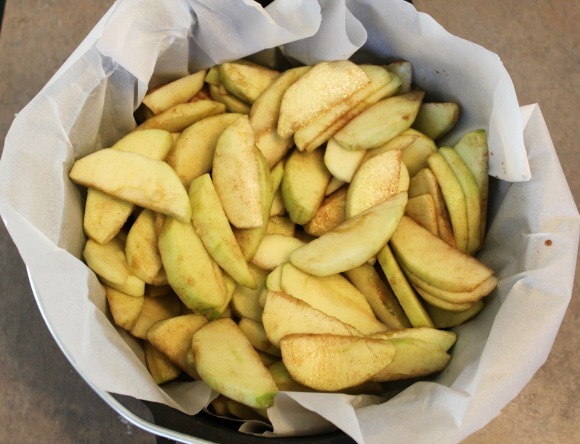 Re-close the bag and move that cinnamon and sugar all over your apples. Try and coat them as evenly as possible. Make sure that bag has as little air as possible in it and place them in the refrigerator. Keep them refrigerated until it’s time to add them to the cooler before you leave. Now comes the fun part! This cobbler is seriously easy to assemble, but looks fantastic. Prepare your cooking area. 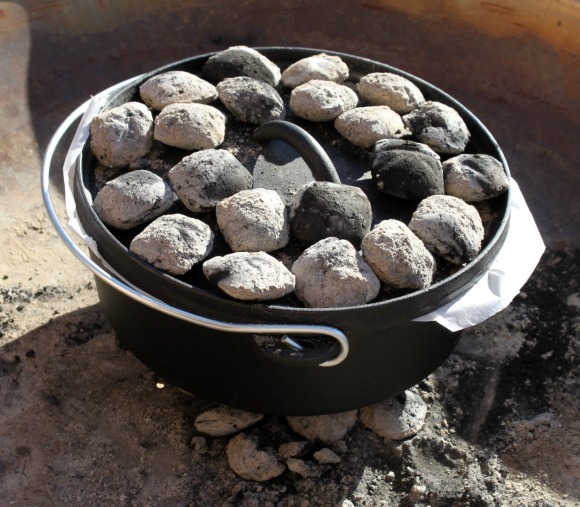 I’m a huge fan of charcoal with dutch ovens because it’s fairly easy to regulate the temperature. Wood is definitely doable, but takes a little more know-how. 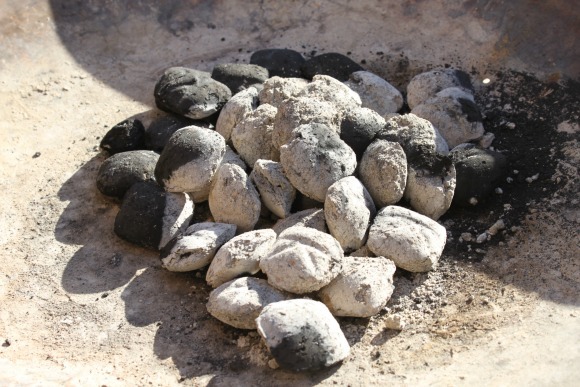 You’ll want your briquettes white hot or your wood coals bright red. I wasn’t sure quite how many briquettes to use so I experimented. I heated up 30+ and used them all so my cobbler cooked pretty quickly. I’ve made do without a charcoal chimney starter, but I’m just getting ready to invest in one (one too many windy cooking sessions.) Without one, I’m spending time making sure my briquettes are staying lit, but with one I could walk away without any worries. 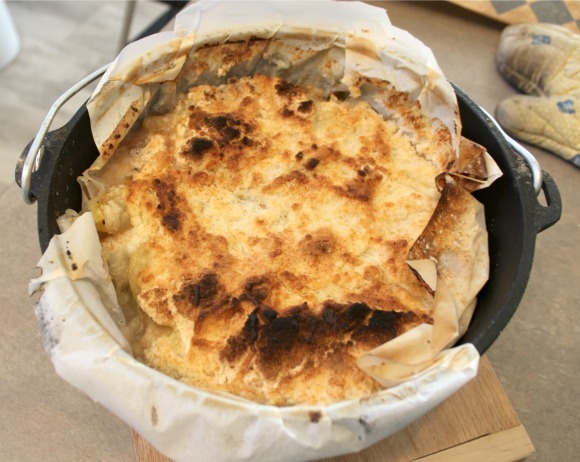 If you plan to line your dutch oven with parchment paper – do it now. (For an easy trick on how to create a circular shape – see my post on Dutch Oven Vegetarian Lasagna for a quick how-to.) 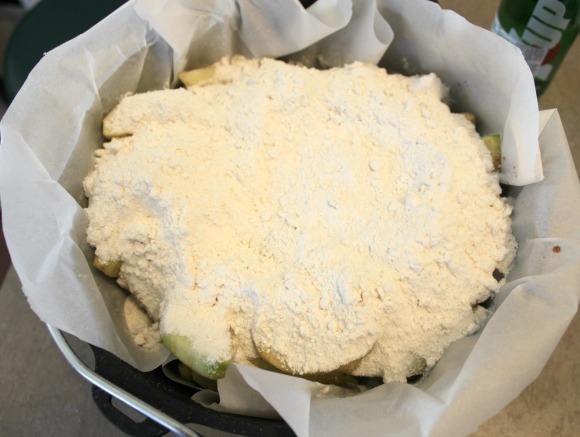 Once your dutch oven is ready – empty your zip top bag of apples carefully into the bottom of the dutch oven. 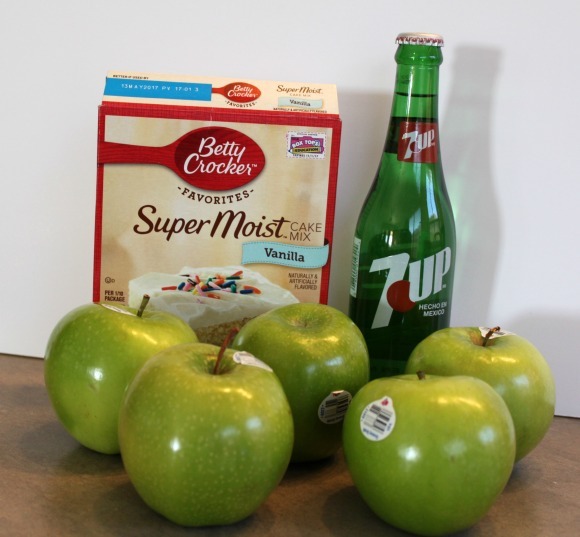 Open your box of cake mix and shake the cake mix as evenly as possible over the apples. Do not stir! 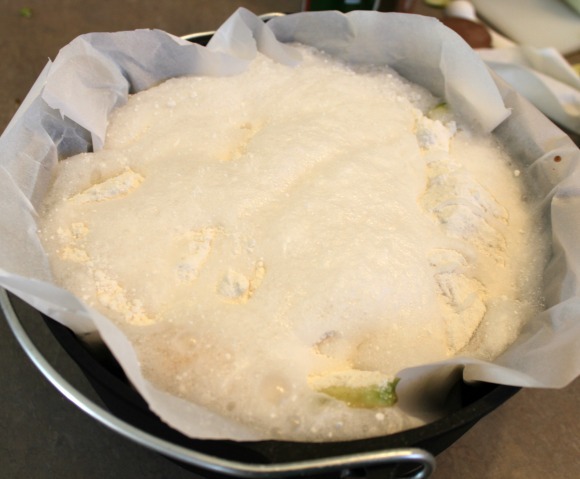 Now crack open that bottle of lemon-lime soda and pour it over the top of the cake mix. Try to get as much of it as wet as possible. Still no stirring! It’ll bubble up in a very satisfying way. Cut your butter into small pieces and add it to the top of the cobbler before covering it with the lid. 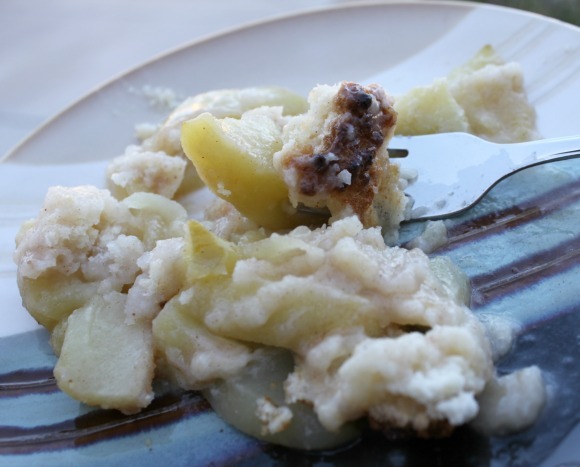 Despite being made with a boxed cake mix – the texture of this cobbler was very similar to more traditional cobblers. However, if you’re looking for a very traditional cobbler top – I do think it could be made with oats and/or nuts in addition to the cake mix and still be pretty amazing. This recipe would be easy to modify if you’re not that into apples. It’d work great with pears, peaches, raspberries, blueberries, or any combination of those fruits. Enjoy! Made this over the weekend – was sooo delicious and a big hit! Awesome! Something about cooking it in cast iron just makes it taste better. How many ounces of 7-Up? I used a 16 oz bottle and it turned out too liquidy! Sorry Tom. A 12 oz bottle (or can) should have been sufficient. Clarified the post. I made this cobbler in cast iron Dutch oven and cooked in electric oven. I made this over the weekend in a cast-iron Dutch oven. Tied for first in dessert contest. Kids were begging for more.